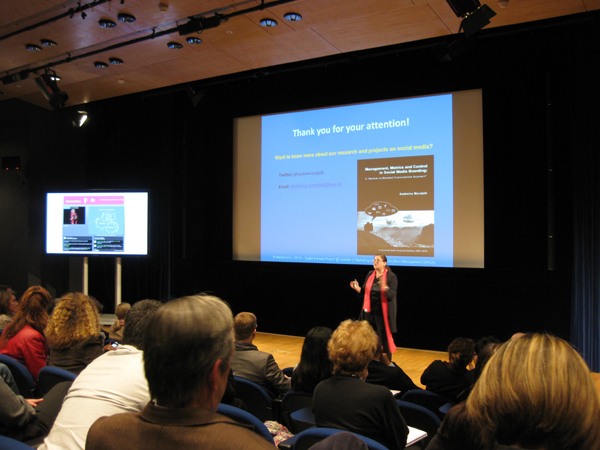 The Lac Leman Forum this year organized a practitioner oriented conference “Navigating the Social Media Jungle”. It was held at the beautiful Olympic Museum in Lausanne. The keynote speakers covered a variety of topics, from Paul Argenti on Corporate Communication, insights on the social media strategy of the World Economic forum (Monck), to the legal issues of Web 2.0 (prof. Cottier) and the metrics in social media branding (Prof. Mandelli, in the picture). You are currently browsing the Sabrina Bresciani blog archives for May, 2010.